We help with a wide range health problems of children (paediatric specialist consultant), their families, and adults, who have ongoing health problems that have not yet been sorted out. Our focus is on getting you well again. 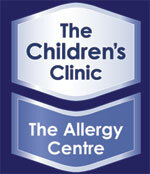 Read more information to help you following your paediatric consultation at the Childrens Clinic | Allergy Centre. Special infant formula – which one to use? Probiotics – who needs them – how to prevent eczema? Cetirizine – ETAC study – how to prevent asthma? Dust mite allergy – what to do? Skin allergy tests – who should get tested? Vitamin/mineral supplements – who needs them?